Starting Strong is the most recent in the suite of complementary initiatives and is designed for ambitious female entrepreneurs who are at an early stage in the development of their business. The business will typically be in the early revenue or pre-revenue stage, but will have moved well beyond the concept stage. Starting Strong is aimed at exceptional female entrepreneurs, whose length of pre- revenue development, degree of innovation and growth potential are all significantly greater than the norm. It was recognised that Starting Strong participants would have less resources available to them than Going for Growth participants, as many of them are at an early revenue or pre-revenue stage and would need further supports. Accordingly, as well as the funding for Going for Growth, which underpins the basic costs of running Starting Strong, additional sources of funding were sought to meet these additional needs. We are delighted that the following corporate sponsors have become Starting Strong Supporters for 2018 – Beauchamps, Boots, Citi, Glandore, KPMG, Megazyme, Paypal and Softco. The support by these corporates meant that Starting Strong participants have a specially tailored programme; they will attend several relevant topic based workshop. A major celebratory event will also be held at the end of the cycle. Participation on this programme has been hugely beneficial. The support and motivation I have received from fellow participants and our Lead Entrepreneur; being with people who are dealing with or have dealt with similar challenges; the network it has opened up to me as a female entrepreneur in Ireland. All have been invaluable. The peer learning in Starting Strong was phenomenal. The entrepreneurs in my group were smart, ambitious and generous with their support and experience. The learnings from these sessions will continue to influence my decision making as GRID scales. 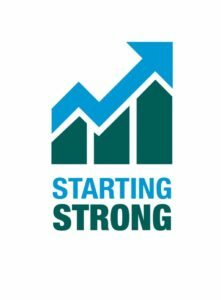 Starting Strong is a great opportunity to meet entrepreneurs at a similar stage of development, to share challenges, opportunities and connections and to support each other, all under the watchful stewardship of a Lead Entrepreneur who has come through the other side! I enjoyed and benefited from every single aspect of the programme - meeting with inspiring female entrepreneurs, learning from subject matter experts and top class industry professionals in bespoke workshops, and tapping into the superb strategic advisory support provided by mentors who have been there and done it. I would highly recommend the programme. Starting Strong is a unique opportunity to gain invaluable advice from hugely successful businesswomen who give their time and energy so generously. It will force you to step back from the operations of the business and challenge you to believe that anything is possible. It will offer networking opportunities at the highest level and the insights into proven business models and strategies will be instrumental to your business. I cannot recommend the Programme highly enough to ambitious entrepreneurs. I am confident that Purcell & Woodcock has started strong and I look forward to continuing my journey within this fabulous community. I found Starting Strong a huge benefit to me and my company. There was so much learning from the group and from the Lead Entrepreneur. It can be a lonely place setting up a new business and all the stress that goes with it. I found great support in the fact that I wasn't alone in making mistakes and through the process found lots solutions. The programme is practical and professional and I am very glad to have been able to be part of it. Its refreshing to be among like-minded women with huge global dreams  no apologies, just determination. Its also given me a network that has been, and will be, invaluable to my business. I found the whole experience challenging and insightful. Starting Strong has been a great experience. Meeting like minded women going through the same trails, tribulations and highs of running your own business. Sharing information honestly and supportively with the help of a knowledgeable leader. An invaluable experience. Starting Strong has been a great experience. The advice shared with us by our Lead Entrepreneur has been practical, informative and inspirational. Meeting fellow entrepreneurs and learning in a round table fashion is so collaborative and supportive. I feel I have a whole new set of cheerleaders as I continue to grow the business of Employmum. Joining a network of passionate, committed and extraordinarily ambitious female entrepreneurs has motivated me to think bigger and push harder in my own business. The structured topic-based meetings enable participants to distil the key learnings and apply them to their business. I am privileged to have taken part this year. I highly recommend participation to female entrepreneurs who are serious about building their business. I loved Starting Strong experience. The whole process is brilliant, we had an amazing Lead Entrepreneur, who inspired us by showing us what was possible and being so generous with her time, advice and feedback. I moved to setting realistic and concrete goals as a result on the participation in Starting Strong. What's great is you not only get to work with your own Lead but it is a brilliant oppurtunity to meet other business leaders. The programme is a really unique environment and I would highly recommend anyone starting out to apply, everyone you meet are incredibly generous with time, advice and sharing their own experience. Starting Strong was a fantastic experience. The comradery between the participants was extremely positive. The group provided a sanity check when I needed it most. They were a great support. Being a participant on this years Starting Strong programme has been a transformative experience. I have changed the way I view myself in business. I feel more empowered, focused, energised and brave. Having Susan Spence as my Lead Entrepreneur was absolutely inspiring and having such a wonderful group of peers around the table, was not only supportive but eye opening to realise that despite being in different fields, we all were experiencing the same struggles. Having like minded peers you can pick up the phone to or send over an email to looking for feedback is invaluable! No man is an island and I now feel part of a community. Taking part in Starting Strong has helped me define a clearer, more focused strategy on how to scale our business and in particular design the architecture how to do that the way we want to do it. At the beginning of the course, I was somewhat apprehensive that we would all come out of Starting Strong with a prescribed, one size fits all business model, and one that I didn't want to adopt. However, working with our Lead Entrepreneur, I began to develop the business model that not only suits our business but also makes it a profitable and scalable one. It has reignited the excitement in the business. I have come away from Starting Strong with a top level view of the business, as a business owner rather than a day to day business operator. The Starting Strong programme was invaluable to me at this stage in growing our business. The female hive mind setting of the round table supported and guided me in many applicable areas. Listening and learning from others' experiences was so beneficial and our Lead Entrepreneur was inspirational and extremely informative. Starting Strong for me was a monthly check in with people of diverse experience and expertise. They positively asked 'why' when I struggled and applauded when I suceeded. I hope I did the same for them. I made some brave decisions in their protective custody. The opportunity on Starting Strong to engage with a group of talented women with such diverse backgrounds, skills and aspirations but all facing similar challenges is a rare and invaluable support. It's such an engaging and supportive network. Our Lead Entrepreneur was a terrific sponsor and role model. I took learnings away from every session and there was an extra bounce in my step on the days we met. Beginning the cycle I expected I would gain a lot of expertise, but I had no idea as to the extent of that expertise, or the friendships I would make along the way. Thank you.